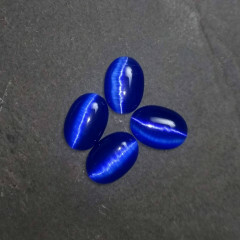 Gorgeous Cats Eye pieces – they are typically made of either glass or a synthetic material – plastic or another material. This ‘stone’ is a gorgeous synthetic coloured stone, with a ‘cats eye’ effect – it has a chatoyant property to it, and shows a gorgeous light at certain angles, similar to Selenite. Genuine natural cats eye pieces exist, they are Chrysoberyl and tend to be extremely valuable. The synthetic stone is made by stretching molten glass strands into a block and using a machine to cut pieces from it – unfortunately, not much information is available on this process so we aren’t able to elaborate too much. Crystal healers tend to place this stone in the same category as all other chatoyant gemstones, and say it has the same healing properties as them too. As an artificial, man made glass, some people do not consider the stone to have any healing properties – ultimately, it depends on what you personally believe, and whether you feel anything from the stone.